The following instructions for the temporary spare tire should be observed: 1. 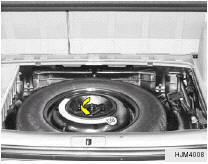 Check inflation pressure as soon as practical after installing the spare tire, and adjust to the specified pressure. The tire pressure should be periodically checked and maintained at the specified pressure while the tire is stored. 2. The spare tire should only be used temporarily and should be returned to the luggage compartment as soon as the original tire can be repaired or replaced. 3. Continuous use at speeds of over 50 mph (80 km/h) is not recommended. 4. As the temporary spare tire is specifically designed for your vehicle, it should not be used on any other vehicle. 5. The temporary spare tire should not be used on any other wheels, nor should standard tires, snow tires, wheel covers or trim rings be used with the temporary spare wheel. 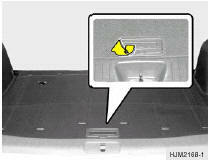 If such use is attempted, damage to these items or other car components may occur. 6. The temporary spare tire pressure should be checked once a month while the tire is stored. CAUTION: o Do not use snow chains with your temporary spare tire. o Do not use more than one temporary spare tire at a time. o Do not tow a trailer while the temporary spare tire is installed. WARNING: The temporary spare tire is for emergency use only. Do not operate your vehicle on this temporary spare at speeds over 50 mph (80 kmh). The original tire should be repaired or replaced as soon as is possible to avoid failure of the spare possibly leading to personal injury or death. 1. Open the tail gate. 2. Remove the luggage mat. 3. Remove the luggage under tray.